Franz Joseph Gall (March 9, 1758 – August 22, 1828) was a German neuroanatomist and physiologist, the father of phrenology. He was also one of the early pioneers in the study of the localization of mental functions in the brain. While his belief that certain areas of the brain are responsible for psychological activity proved correct in general terms, his assumption that the shape of the skull reflected personality traits and mental abilities was not, the shape of the skull not corresponding to the topography of the brain. However, Gall's ideas were taken and misused to justify discrimination against various ethnic groups, based on physical features. Gall's work pioneered our understanding of the function of the brain and correspondences between areas of the brain and particular mental activities. This relationship is extremely complex, since the human brain and human mind function in sophisticated, multi-dimensional ways of the highest order. Gall's work constituted only the early beginnings to this important area of study, one which allows us to comprehend ourselves and our abilities as the highest order form of physical life. Gall was born on March 9, 1758, in the Grand Duchy of Baden, in the village of Tiefenbronn (now in Germany). As the second eldest son in a family of ten children, he was intended for the priesthood and was educated by his uncle who was a priest. Gall, however, decided to enroll in the study of medicine, in the city of Strasbourg, France, in 1777. 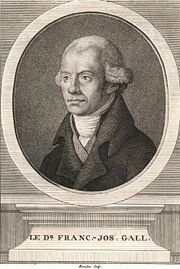 There Gall studied comparative anatomy under Johann Hermann (1738-1800), who taught of the physical similarity of men and apes. In 1781 Gall enrolled in the medical school in Vienna, studying under famous Maximilian Stoll (1742-1787). Gall received the degree of doctor of medicine in 1785 and opened a successful, private practice in Vienna. In 1790 he married for the first time. He became a well-known physician, often treating wealthy and aristocratic patients. In 1794 he even rejected an offer to become the personal physician to Emperor Franz II. By the end of the eighteenth century, Gall developed his theory of “organology" and "Schädellehre" (doctrine of the skull), in which he explained the relationship between brain centers and various personality traits and abilities. With this revolutionary concept, Gall offended religious leaders and scientists alike. The Catholic Church considered his theory as contrary to religion (that the mind, created by God, should have a physical seat in brain matter, was considered anathema). Established science also condemned these ideas for lack of scientific proof of his theory. His ideas were not acceptable to the Austrian government, which eventually banned his teachings for leading to materialism and going against morality and religion. Due to this, Gall, decided to leave Vienna in 1805. Gall sought a teaching position in Germany, and lectured in Berlin and other major German universities. During the Napoleonic Wars he traveled to more than fifty cities throughout Germany, Denmark, the Netherlands, Switzerland, and France. Gall eventually settled in Paris. Revolutionary France was the most hospitable place for Gall's theories. However, Napoleon Bonaparte, the ruling emperor, and the scientific establishment, led by the Institute of France, pronounced his science as invalid. Despite all this, Gall was able to secure a comfortable existence on the basis of his specialty. Gall became a celebrity of sorts as he was accepted into Parisian intellectual salons. In 1819 Gall became a naturalized Frenchman, and eventually tried to obtain admission to the French Academy of Sciences. His efforts, although supported by Étienne Geoffroy Saint-Hilaire, were unsuccessful. He visited Britain in 1823, with the intention of delivering a series of lectures to London universities, but the reception he met there was not warm, and he abandoned his plans. Instead, he continued lecturing in Paris. After his first wife died in Vienna in 1825, Gall took a second wife, Marie Anne Barbe. Gall died in 1828. Although twice married, he had no descendants. After his death, his head was removed and was added to his collection of over three hundred human skulls, skull casts, and brain casts. While in the medical school, Gall noticed the association between external, physical appearance and ability. He saw that some of his colleagues, especially those with special language or memory skills, had distinctive shape to their skulls. Gall concluded that it was probable that physical characteristics and talents were connected, and started to further investigate this theory. Gall collected human and animal skulls and made wax molds of brains in order to study the cranial contours of the brains of specific species that exhibited characteristic behavior. Through comparing the different casts from different brains, he was able to conclude that different regions of the brain corresponded to different personality traits and abilities. Someone with a certain ability had a more developed particular region in the brain, which was reflected in a characteristic bump on the skull. Gall called his theory “organology" and Schädellehre (doctrine of the skull), but later renamed it to simply "the physiology of the brain." He developed a new technique of dissecting the brain, in which he sliced the brain “from below,” unlike other physicians who performed it “from above.” In that way Gall was able to follow the brain stem upwards into the brain, and trace fibers into different parts of the brain. He discovered that the brain was not made of a soft substance, but rather that the soft substance was in fact made of bundles of neurons. He claimed that he discovered centers for different body functions, where the "grey matter" were actual nerves, and the "white matter" served a conducting function. In 1796, another respected German anatomist, Samuel Thomas von Soemmerring (1755-1830). published his Über das Organ der Seele (“On the Organ of the Soul”). He claimed that the sensorium commune ("the human soul") rests in the intraventricular cerebral spinal fluid. Gall never paid special attention to the soul, but argued that psychological phenomena start from specific regions in the cerebral cortex. He claimed that the nervous system was composed of numerous independent nervous centers, which he then mapped and described. This was the first scientific attempt at cerebral localization. Gall attempted to make a definite list of brain centers for each human personality trait and ability. He collected data on thousands of people who showed extremes of talents or possessed some other striking abilities. He visited jails, hospitals, and mortuaries, and measured skulls of the famous, the gifted, criminals, and mental patients. He developed a method of skull-measurement, which he called "cranioscopy" (from cranium: skull, scopos: vision). The instinct of self-defense; courage; the tendency to get into fights. The sense of language and of speech. The sense of connection between numbers. Gall’s method of “cranioscopy” and his theories were later renamed phrenology (from phrenos: mind, logos: study) by his follower Johann Spurzheim. They were initially ill-received with the general public, especially due to church opposition. However, between 1820 and 1840 numerous phrenological societies appeared across Europe and the United States, which popularized phrenology as an esoteric discipline. People started to hire phrenologists, very much like they hired astrologists or tarot-card readers. Gall's phrenological theories and practices were best accepted in England, where the ruling class used it to justify the "inferiority" of its colonial subjects, including the Irish, and then in America, where it became very popular from 1820 to 1850. The misuse of Gall's ideas and work to justify discrimination were deliberately furthered by his associates, including Spurzheim. Later, others tried to improve his theories with systems such as "characterology." However, the basic premise of phrenology proved too simplistic. Gall believed that since psychological functions were localized in the brain, the personality and talents of a person would be identifiable by the shape of their skull. Later work, however, revealed that the surface of the skull does not reflect the topography of the brain, invalidating his idea. However, Gall's contributions to neurological science were significant. He recognized that emotions were not located in the heart but in the brain and that certain parts of the brain controlled particular emotions and actions. At the time these were revolutionary ideas. The opposition to Gall's ideas can be compared to the earlier opposition to Copernicus' theory that the earth revolved around the sun, since Gall's general concept that psychological functions were localized in the brain proved to have merit, although on a higher level of complexity than he envisioned. Gall, Franz J. 1791. Philosophisch-medicinische Untersuchungen über Natur und Kunst im gesunden und kranken Zustande des Menschen. Gall, Franz J. 1798. Schreiben über seinen bereits geendigten Prodromus über die Verrichtungen des Gehirns der Menschen und der Thiere an Herrn Jos. Fr. von Retzer'. Der neue Teutsche Merkur. Gall, Franz J. 1807. Beantwortung der Ackermann'schen Beurtheilung und Wiederlegung der Gall'schen Hirn- Schedel- und Organenlehre, vom Gesichtspuncte der Erfahrung aus. Von einigen Schülern des Dr. Gall und von ihm selbst berichtigt. Halle. Gall, Franz J. 1807. "Doktor Gall über Irrenanstalten." Allgemeine Zeitung, Vol. 10, No. 21, 81-83. Gall, Franz J. 1825. Sur les fonctions du cerveau et sur celles de chacune de ses parties. avec des observations sur la possibilité de reconnaitre les instincts, les penchans, les talens, ou les dispositions morales et intellectuelles des hommes et des animaux, par la configuration de leur cerveau et de leur tête (6 vols.). Paris: J. B. Baillière. Ackerknecht, E. H. & H. V. Vallois. 1956. Franz Joseph Gall, inventory of phrenology and his collection. Madison, WI: University of Wisconsin Medical School. Temkin O. 1947. "Gall and the Phrenological Movement." Bulletin of the History of Medicine 21: 275-321. Wells, Charlotte F. 1896. Some account of the life and labors of Dr. Franz Joseph Gall, founder of phrenology. Fowler & Wells. Franz Joseph Gall. Phrenology.com. Retrieved February 17, 2007. Franz Joseph Gall. WhoNamedIt.com. Retrieved February 17, 2007. History of "Franz Joseph Gall"